Players can boost Battle Rating by deploying Heroes. Deploy Heroes with Rapport to gain additional stats, greatly increasing Battle Ratings! * Squad Panel provides basic character and deployed Hero information such as Battle Rating, Stats, Skills and Rapport. For more detailed information, go to Cultivation Panel. * Squad Panel provides fast access to functions. 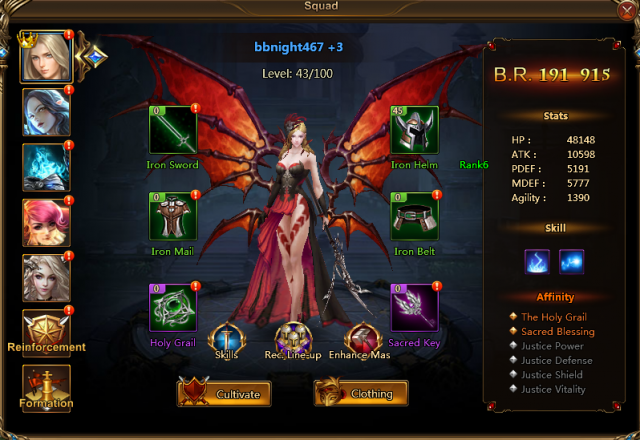 * Player can access Equipment, Skill, Reinforcement, Formation, Hero Cultivation, Fashion and other functions through Squad Panel. * Can switch Reinforcement in this panel and view active Rapports. * Can also view Rapport effects in this panel. * Edit Formation and Skills in this panel. * Drag to change Hero position in squad.